Unfortunately, actually quantifying a country’s soft power is impossible for everybody except for the most ambitious, or perhaps delusional, political scientists. It seems impossible to accurately measure the political impact of China spending billions of dollars to host the 2008 Beijing Olympics or what the Deutsche Akademische Austauschdienst (DAAD) does for building goodwill for Germany by sponsoring students and researchers from other countries to come to Germany. However, all governments sponsor these type of projects, albeit usually on a smaller-scale, because they help raise a nation’s profile and reputation. This is an especially important issue for Indonesiaful because its contributors are Indonesian Fulbright English Teaching Assistants (ETAs), who represent the United States, which is the country with arguably the most soft power in the world. I have witnessed this firsthand as an ETA in Palangkaraya in Central Kalimantan last year and this year as an ETA in Medan. I believe America yields great soft power and influence all over the world, although this article will focus on my experiences in Germany and Indonesia, from which one can see just how far-reaching the USA’s soft power is. This is especially notable, because I think that many fellow Americans, including some political leaders, do not realize just how far-reaching America’s soft power truly is and what a tragedy it would be to waste it or ignore it. As a college student, I was able to spend my junior year abroad, and I decided to study and teach at a German university, TU (Technische Universität) Dortmund. I had been to Germany several times previously as my mother is German and I still have living relatives there, so this was not my first trip abroad. However, until my experiences at TU Dortmund, I had never truly realized how great America’s soft power is. The most obvious symptom is that everybody in Western Europe speaks English, usually quite well. For many older Germans, such as my German grandparents who were born in 1925 learning English was not a priority, but for the generations born after WWII, it was and continues to be supported and expected that they learn to speak English very well. I was also consistently surprised by the large amount of Germans who wished to travel and often to live in the United States. This is especially interesting, because America’s GDP per capita is ranked nineteenth in the world while Germany’s is twenty-seventh. (ii) Thus, it’s not merely a quest for a better life. It was also eye-opening for me to see how much American culture is embedded in contemporary European, in this case German culture. This goes far beyond the outsized presence of McDonald’s and Burger King in European cities. During trips to movie theaters in Germany, I immediately noticed that I was surrounded by posters advertising American stalwarts such as Batman, Twilight, etc. Many, if not most, young Germans have favorite American TV shows, and actors and actresses. We have also introduced sports such as basketball to a worldwide audience. During my time in Dortmund, many of the Germans I encountered seemed more interested in the presidential race between Barack Obama and Mitt Romney than in the upcoming German federal elections. Whether Americans like it or not, we are a subject of much global fascination. Before my Fulbright ETA grants, I thought my time in Germany had prepared me, at least somewhat, for the extent of America’s soft power in Indonesia, but I was drastically mistaken. Last year, I wrote about how initially overwhelming it was to be a bule, or white-skinned foreigner, in Indonesia. However, being an American is even more impressive to most Indonesians since they usually associate America with efficiency, hard work, and other good qualities even if there is some doubt about the average American’s morality in regards to sexual practices, drinking alcohol, and other vices. The belief in the superiority of America is best demonstrated by one of my co-teachers, who recently asked me “why the quality of so many American airlines tended to be so poor (iii) as America is the most sophisticated country in the world.” Unfortunately, their views do not always match reality as it is often difficult to communicate that America faces serious issues, such as the inability of many young Americans to pay for higher education, or national debt that is quickly approaching nineteen trillion dollars, among other issues. Yet I have encountered countless Indonesians who view America as some type of utopia, even if many disagree with some of our moral values. Furthermore, Indonesia, just like Germany, is dominated by American films, fast food restaurants, and a plethora of American products such as Oreos, M&Ms, etc. 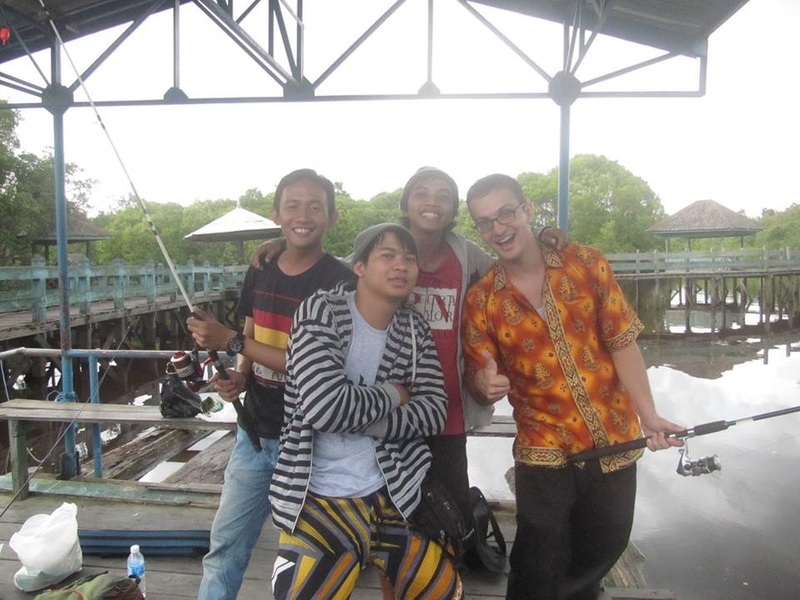 ETA Chris Linnan fishing with some friends in Indonesia. I have taught at an Indonesian high school in Central Kalimantan where students were Christian, Muslim, and other religions and at an extremely conservative Muslim private high school, and in both places it is incredible how many students look up to, and want to study and live in the West, usually the United States. If you ask a classroom of talented students who wants to study in the US the vast majority of hands immediately shoot up. This is an incredible asset as it allows us to attract and seek out talented foreign students and workers, especially in areas that we have a domestic shortage such as the sciences, engineering, etc. Obviously, you will occasionally encounter people who very strongly dislike America in Indonesia or anywhere else for that matter (in my experience, this is usually related to our foreign policy in the Middle East), but frankly, I saw more anti-Americanism from some of my fellow American students at Emory than I have in Indonesia. I think a lot of Americans assume that much of the rest of the world thinks us intrinsically evil, but in my experience this is simply not true. I, like most Americans, think there is great merit in being very cautious in using our power in conflicts abroad. A painful reminder is our last direct military intervention in Iraq which was nothing short of a catastrophe, as it led to the deaths and injuries of thousands of U.S. soldiers, cost us trillions of dollars, and helped cause the current instability in the Middle East. However, we should be equally as weary of becoming an isolationist nation, which ignores the tremendous power that we possess. Previous generations of Americans have worked very hard to build a positive global image, and we would be unwise to waste their efforts. In this dangerous age we live in, in which we face terrorism and other existential threats, we would do well to use all the assets at our disposal, including the incredible soft power that we possess. (i) Joseph Nye, “What China and Russia Don’t Get About Soft Power,” Foreign Policy 29 April 2013, http://foreignpolicy.com/2013/04/29/what-china-and-russia-dont-get-about-soft-power/, accessed 20 November 2015. (ii) “The World Factbook: Country Comparison of GDP Per Capita,” Central Intelligence Agency 1 July 2015, https://www.cia.gov/library/publications/the-world-factbook/rankorder/2004rank.html, accessed 20 November 2015. (iii) This is a wonderful question, which I wish I had the answer to.